Gunfire from the Syrian side of the border hit close to an IDF patrol in the northern Golan Heights. No injuries reported. Gunfire from the Syrian side of the border hit close to an IDF patrol in the northern Golan Heights on Thursday night. There were no injuries or damages. The IDF believes that the fire was not directed at the Israeli soldiers and was part of the ongoing fighting between the Syrian army and the rebels fighting to oust President Bashar Al-Assad. Two weeks ago, fire was opened at an IDF patrol near Tel Fares in the southern Golan Heights, after the troops identified two Syrians who entered an abandoned military outpost located east of the border fence. 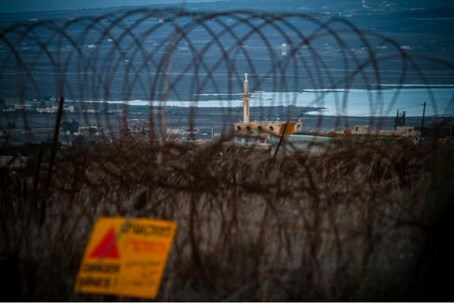 On Thursday afternoon, a rocket alert siren was activated in the Golan Heights region. Local sources said there were unconfirmed reports that the siren activated throughout the region, and into the Jordan Valley area as well. It was not clear why the siren activated, and security personnel said they were investigating the situation. No missiles or rockets have were discovered, and no explosions were heard by residents in the area. The Golan has been tense since the beginning of the conflict in Syria more than two years ago, but so far there have been only minor flare-ups as Syrian small arms fire or mortar rounds hit the Israeli side, prompting an occasional Israeli response. Israel's UN ambassador, Ron Prosor, recently told the Security Council that it was time to condemn the constant spillover of the conflict in Syria into Israel. "Israel is an island of stability in a region steeped in violence, blood and destruction, and we expect that the Security Council will do everything in its power in order to maintain stability," Prosor said.